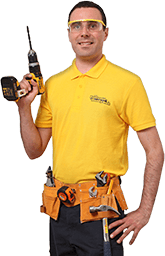 View our rates for handyman, electrical and plumbing services. For personalised quotes or bigger projects please call us at 020 3404 4045 or send your request via our simple contact us form and we will get back to you shortly. * Minimum time per appointment is 1 hour (£31+£24=£55). After the first hour, we will charge on a half-hour basis. Prices are inclusive of all taxes.